A mountain range in Munster, located in Ireland’s Golden Vale. Galtymore reaches a height of 917m (3,009 ft) the highest of the Galty Mountains and the 14th highest peak in Ireland. The North face shows much evidence of glacial erosion. Lough Curra lies between Galtymore and Slievecushnabinna. A popular and easy starting point to climb Galtymore is the ‘Black Road’ which can be accessed from the N8 Dublin to Cork road near the villages of Skeheenarinky and Kilbehenny. It can also be accessed from King’s Yard. Always remember to ensure you are well equipped with knowledge of the mountain and let people know you’re making the climb. Mist can come down unexpectedly, so caution is necessary. Participants can follow a good unsurfaced road, passing several deserted homesteads. To the east, the two peaks of Seefin will be visible, with Knockeenatoung rising behind to the northeast. Hikers will head onto the open mountain to the plateau which is Knocknagalty, and rising majestically ahead is Galtymore. From the wall end, hikers will head in an easterly direction to the top of Galtymore where they will be treated to spectacular views of the Galtee Range, the Knockmealdowns, Comeragh Mountain Ranges and the surrounding valleys. Counties Limerick, Cork and Tipperary. are located on the site where Kilbehenny Community Centre now stands. Many graves date back over 300 years. Our Community Centre boasts excellent showering facilities which are available by contacting one of our committee members. Hot food is also to hand once booked in advance. 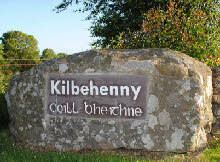 The village of Kilbehenny itself has a local shop, and Post Office where you can purchase supplies for the climb.